“In the rolling hills of a sinful farm community, untouched by time, a gruesome secret has been protected for generations." The contradiction offered by Deadly Blessing’s title might as well refer to Wes Craven’s career. While films like The Hills Have Eyes and A Nightmare on Elm Street prove that the man is (was?) blessed with a lot of talent, it’s usually feast for famine with him, especially when you consider his glory days, where Elm Street was actually sandwiched between Invitation to Hell and The Hills Have Eyes Part 2. Since it took so long for Deadly Blessing to come to DVD, I’d assumed the worst about it, but, as it turns out, this the rare Craven movie that qualifies as perfectly fine and perhaps a little forgettable, save for its proto-Nightmare qualities. Whereas Craven has spent much of his career subverting suburbia, Deadly Blessing takes him to the rural countryside, where newlyweds Martha (Maren Jensen) and Jim Schmidt (Douglas Barr) live on a family homestead. Unfortunately, Jim hails from a clan of Hittites who exiled him from the family when he took off to college and decided to marry Martha, an outsider (and, by proxy, a godless jezebel). In this case, they mean it quite literally since they’re convinced she’s carrying a demonic spawn of some sort; some of the Schmidts even poke around the place babbling about the Incubus that’s waiting to prey on them. It turns out that something is lurking out there, as Jim is killed by an unseen stalker who then proceeds to terrorize Martha and her friends (Sharon Stone and Susan Buckner). If The Hills Have Eyes 2 offers the chance to see what an 80s slasher would look like if it were phoned in by Craven, then Deadly Blessing features a more fully invested Craven poking around in the same territory. It often feels (and even sounds) like a Friday the 13th film and even proceeds a lot like one, what with the extended POV shots and James Horner’s (!) Manfrendini-esque score. 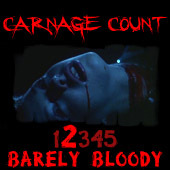 The payoffs aren’t as gruesome, so it’s not as splattery as the other body count movies from this era, but it is sometimes atmospheric with its desolate, eerie rural vibe. But there are also moments where it feels like The Waltons meets The Hills Have Eyes when you have walking freakshow Michael Berryman stalking about during a tender moment between Martha and Jim. Not content to just make a straightforward slasher, Craven also tosses in some supernatural trimming. When the Hittites claim an Incubus is afoot, they mean it quite literally, so there are some vaguely weird sequences where dreams and reality begin to blur. The girls start to get the feeling that they’re being stalked by the Grim Reaper himself, and he starts to prey on their fear of spiders, which pays off in a pretty gross gag towards the end. While the concept does anticipate A Nightmare on Elm Street, the idea here is so half-formed that it muddles the movie, particularly when Craven doesn’t stick the landing. That might be putting it gently: really, it’s more appropriate to say that Deadly Blessing crashes and burns with a nutty finale that doesn’t know when to quit. The movie only makes the faintest of sense once it seemingly wraps up, and a final stinger just makes things even more nuts. You spend the first hour of Deadly Blessing waiting for something to happen only to discover that the back end is filled with all the good stuff: the killer’s identity, their out-of-left-field motive, exploding cars, and more. That’s probably being a little unfair since the movie does have some decent sequences strewn throughout. Speaking of Elm Street, there’s a bathtub scene that should seem pretty familiar, only it features a homicide attempt via snake (so it anticipates both Freddy and Mountaintop Motel Massacre). The film is also pretty polished by Craven’s standards; whereas Last House and The Hills Have Eyes are mired in that grimy,70s exploitation aesthetic, Deadly Blessing has a post-Halloween slasher sheen. Deadly Blessing can also boast Ernest Borgnine among its cast, though he’s done up in a ridiculous Hittite getup and is stuck playing a one-note hardass who disowns two sons during the course of the film when John’s brother, Jim (Douglass Barr, who I spent the whole movie thinking was Lance Guest) gets involved with one of Martha’s friends (Buckner), who is presumably godless because she doesn’t wear a bra. A young Sharon Stone makes her first notable feature appearance, but it isn’t all that noteworthy save for the climax, where she also gets wrapped up in all the insanity. Maybe it’s because I was fully prepared for a bad, nigh-unwatchable Craven effort and the bar was consequently lowered, but I found Deadly Blessing more than tolerable. More than anything, it’s just a half-baked grab bag of horror sub-genres, none of which are done a whole lot of justice. Its main reference point is the then-burgeoning slasher genre, but it also has some residual demonic and occult trappings that were held over from previous decades for good measure. And beneath it all, you can see the faintest hints of Craven’s obsessions peeking through; in fact, this film might be the best reflection of his Baptist upbringing since an evangelical mother-daughter duo (Lois Nettleton and Lisa Hartman) provides even more religious-based hysteria. All told, it’s a pretty minor but solid effort from Craven, which is preferable to a lot of the work immediately preceding and following Elm Street. For whatever reason, it has taken this long for it to come to DVD (and Blu-ray) in Region 1, but Shout Factory made it worth the wait by delivering a solid presentation and a decent amount of extras that include two commentaries (one with Craven, the other with Bruckner and writers Benest and Barr). I’d say it’s a blessing, but that’d be too kind; really, it’s just a good home video release for an okay movie. Naturally, Craven fans will want it if only to fill that Deadly Blessing-sized hole on their shelf. Rent it!